Once more: is there such a thing as metaphysical necessity? Some philosophers distinguish among three classes of necessary (or, conversely, impossible) things: (i) physical necessities (and impossibilities), meaning things that are going to happen (or can never happen) because of the ways the laws of physics are; (ii) logical necessities (and impossibilities), that is things that are true (or impossible) because of the laws of logic; and (iii) metaphysical necessities (and impossibilities), meaning things that are the case (or can never be the case) because of…? Yeah, the latter is the problematic one. Nobody doubts the existence of the laws of physics (though some philosophers reject that kind of talk and prefer to think in terms of causal regularities). Some people think that logical necessity / impossibility is actually the result of human constructs, since one can adopt different kinds of logic, but this is controversial. And then there is a small number of philosophers, the metaphysicians (sometimes they call themselves metaphysicists) who insist on a separate existence of the third category. And this is very controversial. I wrote about metaphysical necessity / impossibility back in 2014, and then again (on the specific issue of “grounding”) in 2015. In both cases, I was rather skeptical of distinguishing metaphysical anything from either the physical or the logical realm. The way I saw it was this: logical necessity / impossibility > physical necessity / impossibility > contingency. That is, if something is, say, logically impossible, it is a fortiori physically impossible, and it can’t happen no matter what the specific circumstances. However, if something is happening, then it must be both physically and logically possible. And so forth. My argument in the past is that whatever examples of alleged metaphysical necessity / impossibility one would come up with it would either turn out to belong to the physical class or to the logical one, with nothing either in between or, somehow, above logic. So what I’d like to do now is to go through each of Antonella’s possibilities for metaphysical necessity, briefly look at the examples that she presents, and see what happens. We will start with the right-center portion of her large circle (labelled “general metaphysical necessities”) and proceed counter-clockwise, one category and set of examples at a time. (I) Logical, mathematical, and geometrical necessity (middle right of the large circle). Her examples here include “necessarily, everything is self-identical,” and: “necessarily, two plus two equals four.” As she points out, some philosophers are skeptical that these are examples of necessity, or that these statements are true, pointing to the existence of non-classical logics, non-euclidean geometries, etc. But I’m going to accept these examples as valid given certain axioms (classical logic, euclidean geometry, and so forth). You may disagree, of course, but as I mentioned above, I’m going to bracket any further discussion of this particular issue. Even if we do accept the examples, however, they fall squarely into the logical end of my continuum above, they are not distinctly metaphysical. (II) Conceptual necessity (upper right of the large circle). Antonella here distinguishes between things that are epistemically necessary, but not metaphysically so (the part of the small conceptual circle that lies outside the largest one), and things that are both epistemically and metaphysically necessary (the little bit of the small conceptual circle that lies inside the largest one). An example of alleged epistemic (but not metaphysical) necessity is the following: “Julius” designates the inventor of the zip. It then is a priori (epistemically) necessary that if anyone invented the zip, Julius did. This seems to me a very weak sense of epistemically necessary, since it simply states that given that X is true, you better take X to be true. I think the use of the word “a priori” is misleading here, as it is obviously a contingent fact that Julius, and not someone else, invented the zip. More importantly, because of the latter possibility, even Antonella agrees that this is a case of metaphysical contingency. What about metaphysical conceptual necessities? Antonella gives two examples: “necessarily, anything colored is extensive,” and “necessarily, there is a valley in between two mountains.” She also adds, however, that some people think these are logical, not distinctly metaphysical necessities. The case seems particularly clear for the second example: once one defines mountains as things that have peaks and are surrounded by valleys, then it is obviously logically necessary that if there are two mountains next to each other they will be separated by a valley. As far as the color example is concerned, it sounds to me like a case of contingency due to biology: colors are not “out there,” but rather the result of the interaction between physico-chemical properties of materials and the specific physiological and perceptual apparatus of a given organism. Perhaps one could say that more obviously intrinsic physical properties necessitate extension (meaning, something more than a geometrical point), but now that begins to look like a physical necessity, and even that is doubtful, if one accepts certain radical views of what actually constitutes the physical world. (III) Grounding and mereology (top of the large circle). Antonella’s examples are “necessarily [P&Q] is grounded in [P], [Q],” and “necessarily, everything is a part of itself.” I have expressed my skepticism about the concept of grounding in metaphysics elsewhere (it’s pretty vague and slippery, and doesn’t seem to add anything), but Antonella herself comments that some people would consider these examples of logical necessity, not a distinctive metaphysical class. (IV) Ethical-deontological necessities (upper left of the large circle). “Necessarily, violence is wrong.” Well, no. My ethics is a naturalistic one, so I don’t think there is anything that is necessary in that realm, at all. Ethics is very clearly, to me, a human construction, constrained by our biology as social animals capable of language, which means it isn’t entirely arbitrary, but also that there is nothing necessary about it. I am, most definitely, not a deontologist. 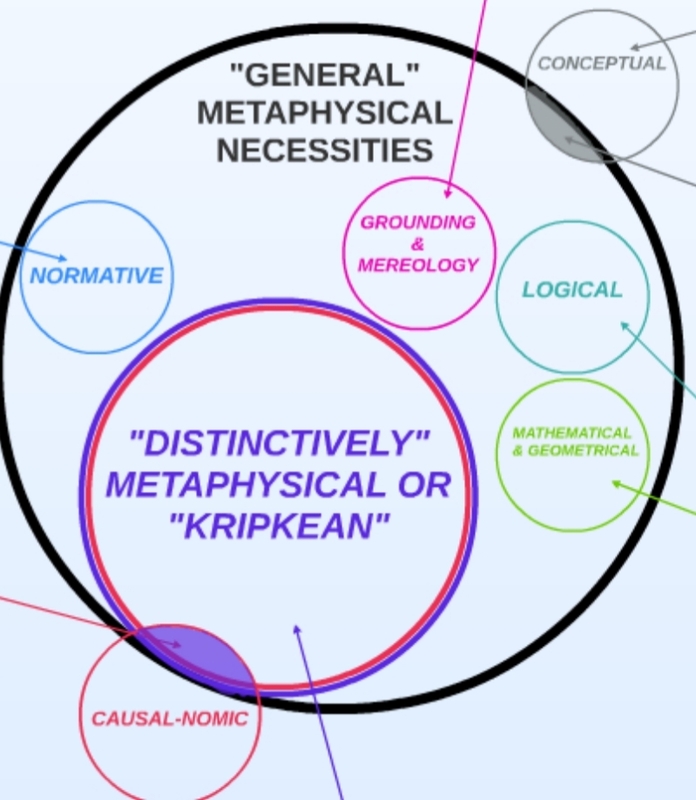 The last two classes of metaphysical necessities proposed by Antonella are important, because they fall into the circle labelled “distinctively metaphysical” (or Kripkean, in honor of the highly influential philosopher Saul Kripke, currently at CUNY’s Graduate Center). That is, in her mind these are the ones that cannot be reduced in any way to logical or physical necessities, so let’s pay particular attention. (V) Causally-nomic (lower left of the large circle). Even Antonella readily admits that it is controversial whether anything at all falls into this group! Her examples include the laws of physics and chemistry, but it is an open question to say the least why the fundamental laws of physics are the way they are (those of chemistry, presumably, can be reduced to physics). It may be that they could not possibly have been different, because of the way the causal world is structured; or perhaps they could have been different, and the ones we observe are that way because of contingency. The first scenario would seem to be a case of physical necessity, while in the second scenario the only constraints would be imposed by logical impossibility and necessity. Again, no distinctive metaphysical criterion appears to be required. (VI) Finally, we get to the most promising class, that of “de re,” a posteriori things that have their source in the fundamental nature, or essence, of things (lower part of the large circle). The pertinent examples are classics of the metaphysical literature: “necessarily, water is H2O,” or “necessarily, I could not have had different parents then the ones I actually have.” I am, however, utterly unconvinced. Water is H2O either as a matter of physical necessity (if the laws of physics could not have been otherwise) or it is a contingent fact about our universe (if the laws of physics could have been different). As for my parents, that seems an entirely contingent fact of our biology. For instance, if humans were a clonal species that reproduced by budding, “I” could have had a lot of different specific parents and still be “me” (not to mention that this example depends on one’s conception of personal identity, a controversial issue in its own right). I guess this third look at metaphysical necessity / impossibility, despite Antonella’s brave and very clever attempt, still leaves me unmoved. I keep thinking that the logic > physics > contingency conceptual scheme is sufficient to account for all examples that have been presented, and that metaphysics is an artificial category situated between logic and physics: each alleged example of metaphysical necessity turns out, upon closer inspection, to be either a case of logical necessity, or one of physical necessity. But I remain open to be convinced otherwise. Stay tuned for a fourth possible look at the issue, a few years down the road! This entry was posted in Metaphysics on June 25, 2018 by Massimo. Time travel is only logical, whether or not possible, in an eternalist view of time. Where those other points in time presumably exist, somewhere out on the temporal dimension. With a presentist view, it would be meaningless, because those configurations of the physical state don’t exist and creating or recreating them would go against myriad laws of physics, such as entropy, inertia and conservation of energy, to name a few. One advantage of a presentist view is it provides a mechanism for reducing the possible to the actual. That would be the process of determination occurring in the physical present. Apparently though, physics has minimal use for any logic that might contradict current belief. Like modern technology, it might destroy some jobs. Kripke argues that natural kind terms also denote rigidly, something that is also implied by Putnam’s work, especially “The Meaning of ‘Meaning’.” The idea is that the word ‘water’ denotes the same substance in every possible world, rather than referring descriptively. Otherwise, one would have to say that in a possible world in which an alien compound — XYZ — had all the descriptive properties of H20 in the actual world that XYZ is water, which both Kripke and Putnam argue has to be mistaken. IMO, this is coming at least to the neighborhood of the classic linguistic fallacy of equivocation. Kripke’s argument for proper name rigidity concerning individuals is convincing. But this leap into universals is not quite. The problem in my view is that 1) it is a leap, not as well developed as it needs to be; and 2) “water” may not be a denotative reference to any entity at all, but rather to a certain conception of an entity we encounter and respond to, and to which we have conventionally affixed this label. Is it possible that an alternative world can be imagined wherein different conceptions of the material can be posited and labelled differently by other conventions? I think that possible. This is not a complete argument against ‘rigid kind reference,’ and isn’t meant to be. But I did read Kripke, and felt the transition into this position was overlooking some essentials that unsettled me. my take on logic is that it is, no more than mathematics, something “out there.” Therefore, yes, I think it is possible that logical coherence would be different in some other possible worlds than our actual one. As you know, I’m ambivalent about this. Some days I lean your way, others I don’t. If we accept that, however, then there is only physics to guide us, I don’t see metaphysics putting forth any notion that is remotely as robust as those of logic and math. Obviously, we can’t have an in-depth discussion about Kripke and Putnam here, but I’m glad you are engaging. Please take the following as an honest articulation of doubts. And I find that even less convincing than the Nixon example. First off, I’m not sure, again, what a natural kind is. Smells of essentialism, which I reject. Second, from a scientific perspective, that’s just wrong. If substance XYZ on the alien world has the same chemical compositions and chemico-physical properties of water than it is water. Period. The fact that both Kripke and Putnam find it mistaken says something about their intuitions, but not about the world out there. Fair enough. But this also is not at all uncontroversial among philosophers. In the same special issue of Synthese curated by Antonella there is a paper by Graham Priest who argues that metaphysical necessity does, in fact, collapse into logical necessity. And he is one of the foremost logicians of this generation. Eric, in response to your question about time travel, it is indeed possible to travel into the future, as described by the “Twin Paradox”. Regarding theological metaphysics, I think it is useful, as it helps me to answer the question, “Why is there never a contradiction in nature?” Without God (capital “g”), one is left with the unsatisfying position that Einstein had when he could only sense a vague creator behind the profound workings of the universe as revealed in physics. I don’t think they are based on essentialism. I think they imply it. As you know, I’m neither an essentialist nor do I believe in metaphysical necessity. I was simply speaking to what I thought were a few dismissive remarks, some of which are being made by people who I am pretty certain don’t understand the relevant texts. now I’m curious to know about why you reject metaphysical necessity. Massimo: I don’t know that I have a well-worked out argument, which is a good part of the reason why I am inclined to be very careful in dismissing Kripke and Putnam. The idea of necessity beyond the emptiest sort of tautologies simply does not cohere in any way with most of the rest of my philosophical commitments. So my instinct is to reject it. But the arguments Kripke and Putnam present are strong, and give me plenty of pause. How would you know? You either have to deny that axiomatically or introduce some kind of meta-logic that would establish it. In either case, bringing in metaphysics doesn’t seem to help. I am not ‘bringing in’ metaphysics any more than you are. If you say that logically impossible worlds are impossible, full stop, then you are making a claim that can neither be justified logically nor empirically. So you are appealing to something ‘beyond’ physics or something that can be said ‘after’ all physical possibilities or necessities are exhausted. If you don’t like the term ‘metaphysical’ for that kind of statement then I don’t mind, but the statement does imply a kind of necessity that is neither logical nor physical. Also, careful here, because metaphysicians themselves have to invoke logic, at least loosely speaking, in order to talk about “possible” worlds at all. Otherwise what differentiates a possible from an impossible world? I say that it is logical possibility that differentiates possible worlds from impossible worlds, but openly admit that I am making a statement about necessity that is neither a logical nor a physical necessity and can no more prove it than I can prove that I am not a brain in a vat or an ‘ancestor simulation’. Physical necessity only applies to a particular physical domain and cannot tell us what could be true were physics otherwise. Logical necessity can only tell us what is necessary given the assumption that something else is true. Nevertheless I am of the confident opinion that I am not a brain in a vat, nor an ancestor simulation and that there is no possible world in which there can be a largest prime number. But if you reject any necessity that is not a logical necessity nor a physical necessity then you cannot say that logically impossible worlds are impossible full stop, and then I can’t see how you can escape from ‘everything is possible’. But to me, “logic” just mean that some of us, from time to time, agree to analyse an argument carefully by restricting ourselves to certain kinds of statements and being as careful as we can that we all know what we and each other mean by those statements. So for example when we say “implies” we carefully define it as a relationship between the truth of one statement and the truth of another. So modus ponens has no ontological efficacy, it all depends upon there being a particular thing we mean by it. So when we say something is logically impossible then all we mean is that the thing is, as far as we have been able to determine using the best method we have of determining such things, absolutely impossible. In the twin paradox, the twin in the slower frame/faster clock didn’t really move into the future, given they meet up at the end. It just means she aged quicker, her body clock ticked faster. This is really no different than having faster metabolism. As I keep pointing out about time, we think of it as the point of the present, moving past to future. Which physics codifies as measures of duration, because they haven’t an effective physical explanation for it. Yet the cause is that change turns future to past. Potential becomes actual, becomes residual. Duration is just the state of the present, as events form and dissolve. We just experience mental sequencing. Which makes time an effect of action, similar to temperature. Time/frequency and temperature are foundational to our physical experience. Think heart rate as expansion/contraction, both sequence and circulation. It could reasonably be argued the right hemisphere os the brain is a thermostat, thus more to registering emotion, while the left is a clock, the sequence of experience, cause/effect, rationalization. Right Luis, I got mixed up and thought that David’s proposed impossibility was for matter to travel faster than the speed of light (“c”), not time travel (which of course seems possible in the forward direction, as theorized by Albert Einstein). I think that I overlooked this because I was focused upon the “or” condition to his question — either physical, or logical, or metaphysical. All logically true things cannot possibly be untrue anywhere, I think, because they are entirely fabricated through language. Thus I consider this a category error. But I reject the other two by themselves as well, or even together. In the end apparently we must begin from a metaphysical position, then go on to a “physical” position (which I quote since it needn’t be causal), and from there can use symbolic representations (such as logic and more). With “God doesn’t play dice” I don’t think Einstein truly sensed “a vague creator behind the profound workings of the universe”, but rather was being a bit facetious, or at least ironic. Note that here he fought the supernatural metaphysics of his colleagues’, through nothing less than the guise of a supernatural entity! Brodix is closer than Luis on the Twin Paradox but the older twin in no way is like “having faster metabolism”. These are the result of two different spacetime intervals due to one twin experiencing acceleration on a space trip. That assumes the two twins have exactly the same rate of aging as measured in their own inertial frames–but the intervals overall are not equal. Again water would seem to be a simple example. Yet there are important differences, even in our world, between classifications eg. “salt water” and “fresh water.” The distinction of “salt water” is not simply that it is H2O with a certain amount of salt added to it – the distinction is actually rather crucial. The amount of salt found in the water determines how we respond to it – whether we can drink it or not. ‘Water is water, it’s H20!’ For certain purposes that’s true; for others – no, it’s not. I’m not drinking any ocean water today; and even the water from a fresh water stream may need purification before becoming available for our drinking purposes (at least if we want to avoid, eg., dysentery. Language is always context bound. Again, I’m not familiar with Putnam’s arguments here, but if he moves in any direction to deny this, he should know better (given other work of his I have read). “I don’t think they are based on essentialism. I think they imply it.” I agree, but this is exactly what unsettles me. It smells of trying to sneak Realism in through the backdoor (which isn’t necessarily true of Kripke’s argument on proper names and individuals). When you say, “quantum mechanics shows, you can have causality without causation”, do you mean it shows that there can be effect without cause? If so then I believe that under ordinary definitions for the “causality” term, this would be something other than causality. In fact if something were to happen that wasn’t ultimately caused to happen, a far more appropriate term would seem to be “magic”. Apparently there is a duality to matter by which it functions as neither “particle” nor “wave”, but both. This is presumed since our measurements in either regard fail to produce the certainty that we’d otherwise expect. This didn’t tremendously disturb Einstein however, since he figured that causality probably did still exist, though was beyond us. So from his metaphysics, causality would remain. I don’t mind professionals taking the converse position as well. But I do mind when they advertise such metaphysical interpretations as “physics”. And I do mind when they make up terms like “natural uncertainty” to reference it, or decide that “causality without cause” can, in this one unique manner, exist. It may be that Einstein was wrong that humans have simply been too ignorant to understand this stuff. But if so then he was wrong as a naturalist. Conversely most of the physics community would then be right, though right as something that they’ve not yet admitted. The combined argument puts pressure on the idea that we only need logical and physical modality. The inquiry that is being pursued is like the continuum hypothesis. Is there a natural modality falling between logical and physical modality? Vaidya argues that logical modality cannot rest on logical or physical facts alone, so there must be a distinct space. Buzaglo argues that there exists metaphysically possible worlds that are not physically possible, given certain examples concerning particle decay and symmetry. These arguments are independent of many of the standard considerations that favor deflating metaphysical modality to physical or inflating metaphysical to logical. The combined argumentx should be considered. I don’t think I am. If a mathematician says that it is impossible to square the circle she is not making a metaphysical statement, but a mathematical one. Same if someone says X is logically impossible. It’s logic, not metaphysics.